Recently I received a message from Brian Bainbridge, who is a supporter of 16 Photographs At Ohrdruf and the relative of an Ohrdruf liberator. In fact, his father served along-side my own grandfather in the 365th Medical Battalion. 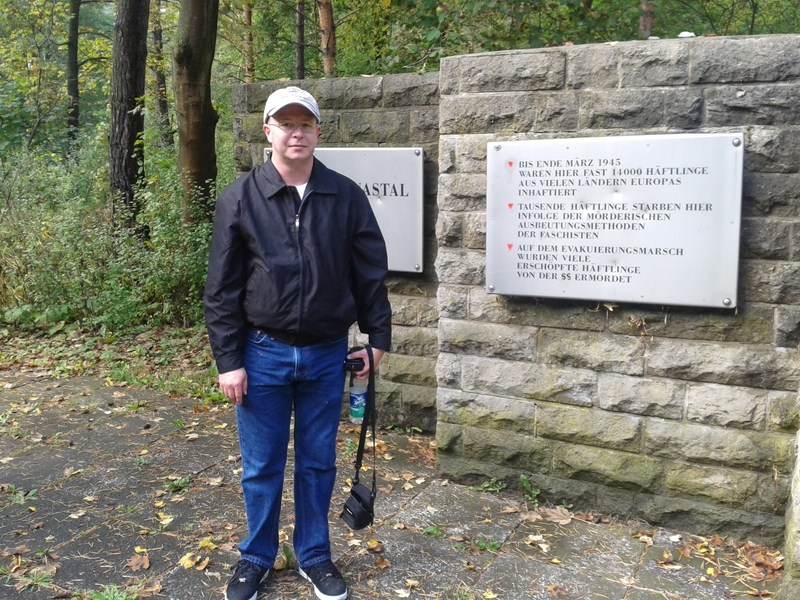 Brian was on his way to Germany and was interested in seeing the site of the camp. However, the camp is now inside a German military complex and is not easy to get access. He wanted to know if I knew any way for him to see the site. I was happy to be able to connect with with Doug and Ute Dillard, who I’ve written about before. Colonel Dillard fought in WWII with the 82nd Airborne, his wife Ute is a German national who is a member of the Jonastal Foundation, who preserve the history of the Ohrdruf camp, as well as several other camps in the vicinity of the Nazi stronghold build by the prisoners of those camps called Jonastal. This week, Brian sent me this great story of his visit. I’ve included the whole thing below, unedited and with his permission. I think it is great that he was able to see the camp (I’ve never been able to see it in person, and hope to see it soon) and I’m grateful he sent along this letter. Among the first places I had planned to visit during my trip through Europe was a little town in Germany, far from the beaten path but sacred in the hearts of many. It wasn’t a cathedral or a shopping center, a tourist attraction or a resort. It was a place of remembrance that I hope the world will not soon forget. Arriving in Frankfurt, I made my way to the trains and a little town called Arnstadt in central Germany. It’s a quiet little town made famous by Bach, Marlitt, and the culture that can still be seen in the faces and the smiles of those who still call the area home. Indeed, that rich history provides a sharp contrast for the darker chapters that have left their stain on the otherwise beautiful Thuringen landscape. After a night of negotiation and planning, my visit was finalized. In the morning, I knew I’d be visiting a place where thousands had died and the suffering was so severe that words fail to convey the horrors experienced by so many innocents at the hands of the Nazi regime. While I had visited Auschwitz and Theresienstadt in the Summer of 2000, this visit felt much different. I was not just visiting a place on a map, a simple destination to be found with a compass and a guidebook. I was visiting a place where my grandfather and fellow members of the 4th Armored and 89th Infantry Divisions had brought the rays of freedom and justice to those who tyranny had oppressed. Thus, through a steady downpour I made my way via taxi to Ohrdruf and an appointment I will never forget. 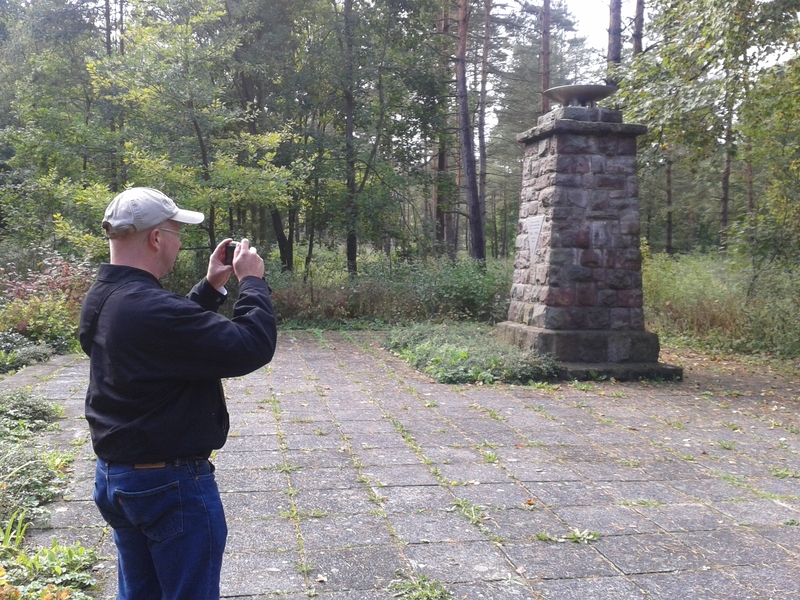 The site of the former camp is located on a Bundeswehr Training Facility, and it is therefore necessary to receive permission from the military to visit. Fortunately, their public relations liaison was very accommodating and arranged a driver and a car to take me to the site. The drive from the gate to the site takes about 15 minutes. It’s a winding drive that takes you over hill and dale, through stunted forests and open fields. Along the way we didn’t see a soul in sight even though ghosts were all around. The fields were empty and the roads wide open. According to my intrepid driver, German soldiers don’t like to train in the rain; apparently it causes their tanks to rust. After feeling lost, we arrived on a dirt road where we could see clear across the nearby valleys. The scenery the view provided was right out of a Thomas Cole painting. Had the weather been sunnier and a bit warmer, I could easily imagine families on picnic and lovers frolicking in the fields nearby. For miles upon miles, there was a clear view of the entire region. Indeed, in that moment I knew that all of those people in the nearby town who had claimed “we didn’t know” were full of it because you could see the site from miles away. Brian Bainbridge at the Ohrdruf memorial. Photo courtesy Ute Dillard. Of course, the serene image I saw was quickly shattered by the bell and memorial that stood less than thirty feet from where we parked. That bell and that muted memorial were the reminders of why I had come. For a moment, I closed my eyes and imagined the vastly different scene my grandfather had seen in April 1945 when he had stood on that very same spot. I’d be lying if I said that tears didn’t gently flow from my eyes in that moment. Beside the memorial a decaying building foundation is all that remains of the former concentration camp. It’s maybe 10 inches tall and rises from the neatly trimmed and maintained blades of grass. 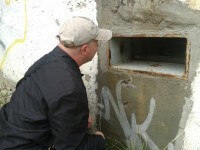 This small 50 foot long by 15 foot wide foundation is all that remains of a camp that once held over 12,000 prisoners. It’s a stark reminder that even bricks and mortar fade away through the passage of time. I stood there near that foundation reading the signs put up by the German government. The signs detailed the history of the camp, the liberation, and the aftermath of the events that took place that April day. During WWI it had been a prisoner of war camp, and in the interwar years it had lain largely dormant until the Hitler Youth set up their training camp there. By 1944, the needs of the war effort changed. The German economy needed more prisoners, and more specifically, slave laborers to do their bidding. By late 1944, the Nazi’s designated Ohrdruf as a Koncentrationslager; the reasons why I will save for another post covering what happened at the nearby Jonastal site. Brian Bainbridge at Ohrdruf. Photo courtesy Ute Dillard. Of course, anyone who has ever visited Dachau, Buchenwald, Auschwitz, or any of the other major concentration or death camps knows the emotions that go through your mind. On my visits, I have seen “tough as nails” men break down and weep openly. I have done it myself and this day was no different. Thus, I stood off in the grass beneath a tall tree that I’m sure was there at liberation due to its size, and I cried. I said a brief prayer thanking the Lord for men like my grandfather and his fellow veterans. I prayed that the world would never forget what happened in Europe and Asia between 1933 and 1945. Then, as I lit a cigarette my mind wandered back to 1945 and I wondered whether my grandfather had done the same thing on that very spot. Of course, I’ll never know. Like so many men of his generation, he never really talked about the experience. The liberation of Ohrdruf was a horrible moment in a series of horrible moments they endured with courage and steadfast determination. All I know for sure is that I am proud to know that someone in my family stood up to the Nazi bastards and fought them until they were no more than a dark and bloodied page in the annals of history. I’d like to thank Matthew Nash, Ute Dillard, and Captain Peters for all of the information and assistance that made my visit possible. It was a once in a lifetime moment that I’ll never forget.